I’m a little behind on things lately. Many of you asked for a post on what I’d planned to do with the parsley simple syrup mentioned in this post. Thanks for bearing with me. I’m in the process packing up our Brooklyn house for a move back to Austin at the end of the month. Though we’re sad to leave the wonderful things and people in our New York lives, we’ll be buying our first home and preparing to hopefully have kiddos at some point. In other news, I’m doing NaNoWriMo, you know, because I didn’t have enough going on already. This is my first attempt at writing fiction (and it’s really fun). Any other folks out there doing this insane writing challenge? I realize that I owe you a little update on the book, too. The final manuscript is in and now the fun stuff begins. We’re receiving the first design and cover mock-ups; it’s really going to be a book, and a pretty one at that, thanks largely in part to Agent Meredith’s illustrations and Pen-Pal Alison’s gorgeous calligraphy. 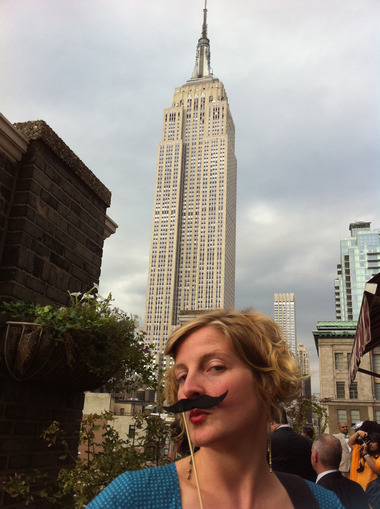 Bye, bye New York, there’s no disguising your charms.Our friends from Austin married recently in Manhattan, and a few photos from their wedding (and mustache swag, such a cute idea!!) seemed appropriate for this post. Simple syrups are a great way to use up those those herbs you bought with good intentions and then promptly forgot to use, or used some of but not all and find yourself with a slowly yellowing bunch of parsley, cilantro or basil. It doesn’t matter what herbs you use, since the process is pretty much the same. The beauty of this process it to use up what you have on hand and not go buy more stuff. A simple shifting of utility with your kitchen assets. From my experimental parsley simple syrup, I made buttermilk parsley ice cream and apple parsley preserves. It’s important to note that if you’re planning to use your syrup in longer-cooked things like spreads and preserves that you’ll probably lose most of the herb infusion (and should instead swirl herbs directly in the preserving pan toward the end of the cook time to infuse things like that). Herbs are tender and subjecting the flavored sugar syrup to heat (even long enough for a super-small batch to set, just 10 min) neutralizes the aromatic nature of the sugar. 1. Chop a bundle of parsley (or whatever you’re using) coarsely, stems and all, and place it a medium-sized, glass mixing bowl. 3. Remove sugar liquid from heat and pour it over your chopped parsley. Stir to incorporate the greens thoroughly. Let cool on the counter (for an hour or so), cover and then place mixture in the fridge overnight. 4. Strain parsley chunks from syrup using a couple pieces of dampened cheesecloth set over a wire-mesh strainer. This syrup keeps safely in the fridge (before developing an interesting film of mysterious bacteria, yeasts and/or molds) for about a week, so use it up!